BIOPAC provides a wide range of sensor options for fNIR functional near infrared optical imaging systems. Adult 16-channel, Adult 4-channel split, Pediatric 2-channel, or Phantom (test) are all provided. 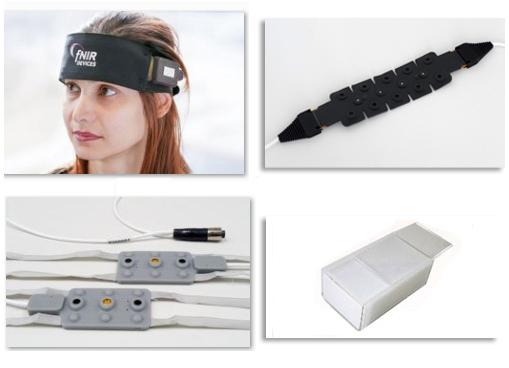 fNIR systems provide real-time monitoring of tissue oxygenation in the brain as subjects take tests, perform tasks, or receive stimulation and allows researchers to quantitatively assess brain functions—such as attention, memory, planning, and problem solving—while individuals perform cognitive tasks. It eliminates many of the drawbacks of MRI and provides a safe, affordable, noninvasive solution for cognitive function assessment. The fNIR device provides relative change in hemoglobin levels, calculated using a modified Beer-Lambert law. The powerful vspectroscopy imaging tool measures NIR light absorbance in blood of hemoglobin with and without oxygen and provides information about ongoing brain activity similar to functional MRI studies.